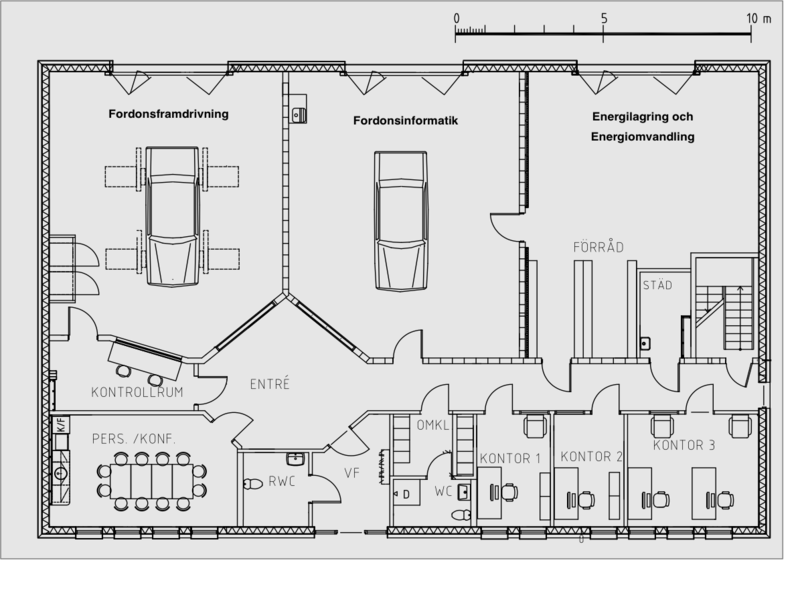 The Vehicle Lab is in fact a complete building, L-huset (the L-building). Within the building there are three laboratories, namely the laboratory for vehicle propulsion, the laboratory for vehicle informatics, and the laboratory for energy storage and transformation. A sketch of the interior of the building shows the three laboratories alongside an office and a conference room with the laboratory for vehicle propulsion on the left, the Laboratory for vehicle informatics in the middle, and the laboratory for energy conversion and energy storage on the right. Current research projects regard drive cycles, vehicle behavior, hardware in the loop co-simulation, batteries and smart grid technology. The main equipment of the Vehicle Propulsion Laborarory is the four wheel vehicle dynamometer that was funded by the Moviii project, seen on the right. 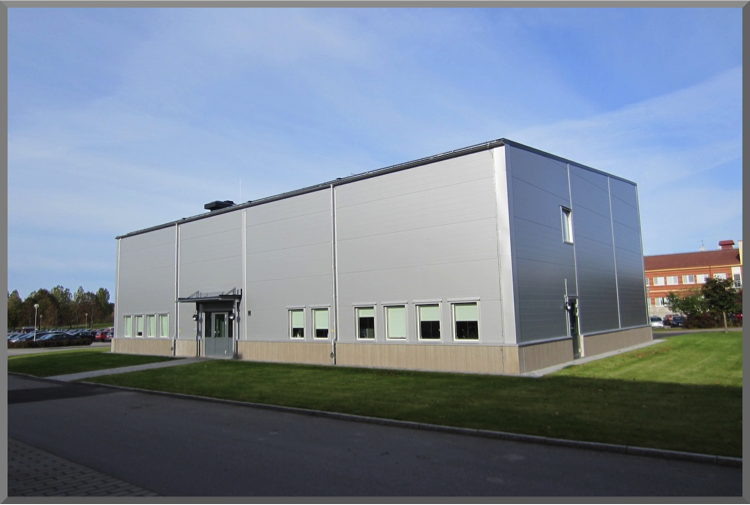 That laboratory is developed and extended together with Rototest and VTI. It is used for measurements and for simulator experiments. Drive cycles are used for vehicle testing and certification, but also as an engineering tool during development. In the latter application an important question is what test cycle to use to be able to excite and examine a certain component or function under study. In general terms the aim is to establish the correspondence between drive cycle and test object. Two projects that have been performed so far are a study of co-surge in a twin turbo V-engine car, and a study of a split axle hybrid where a diesel drives the front axle and an electrical motor drives the rear axle. The vehicle behavior part of the project combines the propulsion laboratory with the informatics laboratory in order to find efficient descriptions. 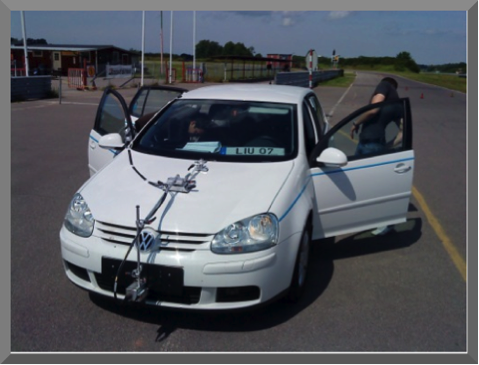 The picture below shows one of our cars equipped with additional modern sensing equipment on the race track we collaborate with to obtain measurements. Projects so far has been about powertrain oscillation analysis aiming at tire pressure analysis, and models for at-the-limit maneuvers. The latter models have been used for calculations of time-optimal behavior. 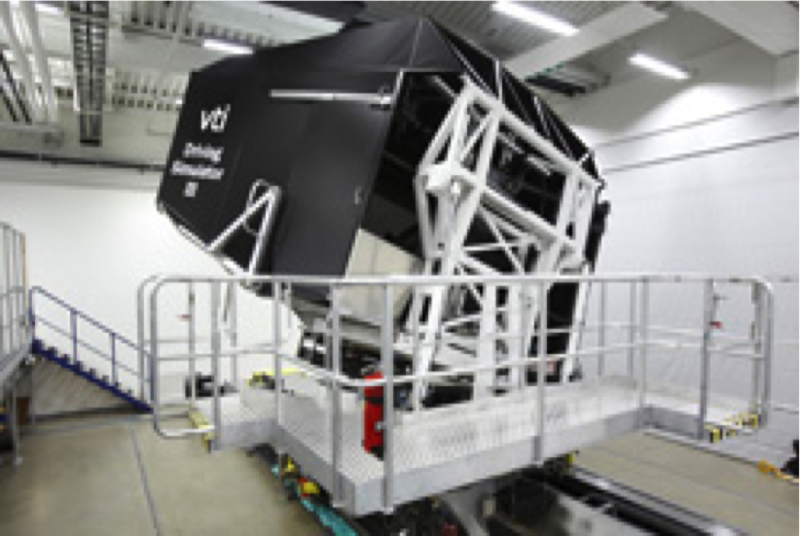 I an attempt to increase the fidelity of moving base simulators while at the same time developing a new tool for evaluating powertrain solutions the VTI moving base simulator SimIII has been connected with the chassis dynamometer in the Vehicle Propulsion Laborarory. The physical distance between the facilities is about 500m. The setup lets the driver of the SimIII simulator experience an actual powertrain while technicians are given a new tool to evaluate powertrains solutions in a controlled environment. For this purpose a pedal robot was constructed that actuates the throttle and brake requested by the driver in the moving base simulator over at the VTI facility. 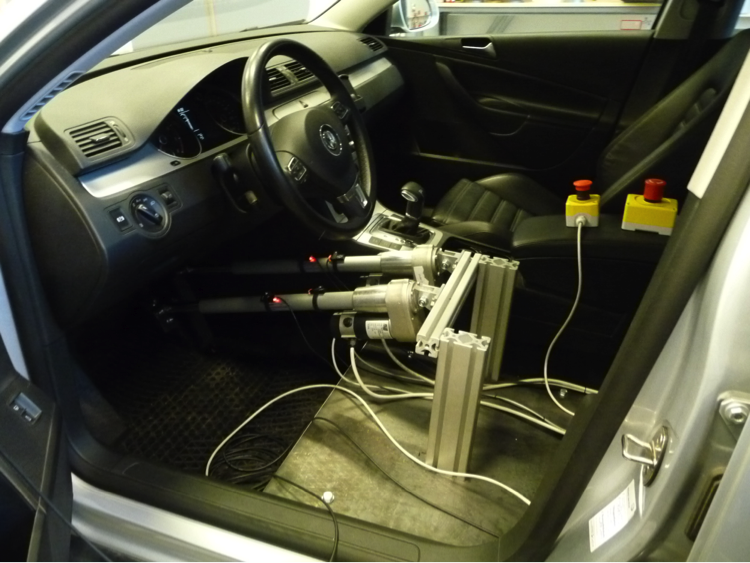 The vehicle response is then measured and sent to the VTI facility where it is actuated in the moving base simulator. Results from running the complete setup showed expected functionality and we are successful in performing a driving mission based on real road topography data. Vehicle acceleration and general driving feel was perceived as realistic by the test subjects. The project got some media attention such as 20 minutes in the Swedish national radio show Vetenskapsradion, local TV and news papers covering scientific progress. The Vehicle Informatics Laboratory is used to equip cars with special sensors in order to perform measurements of vehicle behavior. The purpose is to find efficient descriptions of for at-the-limit maneuvers that can for example be used in stability control. Other topics are vehicle mass and center of gravity estimation for use in warning systems or as input to the stability control system. 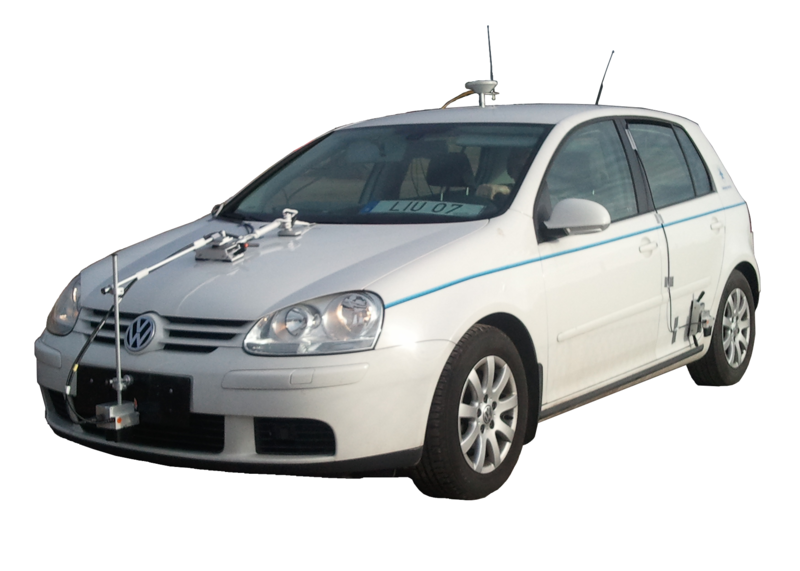 The vehicle has also been equipped with a camera in a cooperation with the image processing group to gather ground truth data for use in development of image processing algorithms for ego motion and traffic sign recognition. In the Laboratory for Engergy Conversion and Energy storage there is space for labb scale and full scale models of typical network of home appliances and other devices consuming power. The L-building is also prepared for alternative energy sources such as solar panels or wind turbines. This will enable realistic experiments with load prediction and smart grid technology. In another application battery cells or complete packs can be studied for modeling purposes, load balancing or diagnosis. 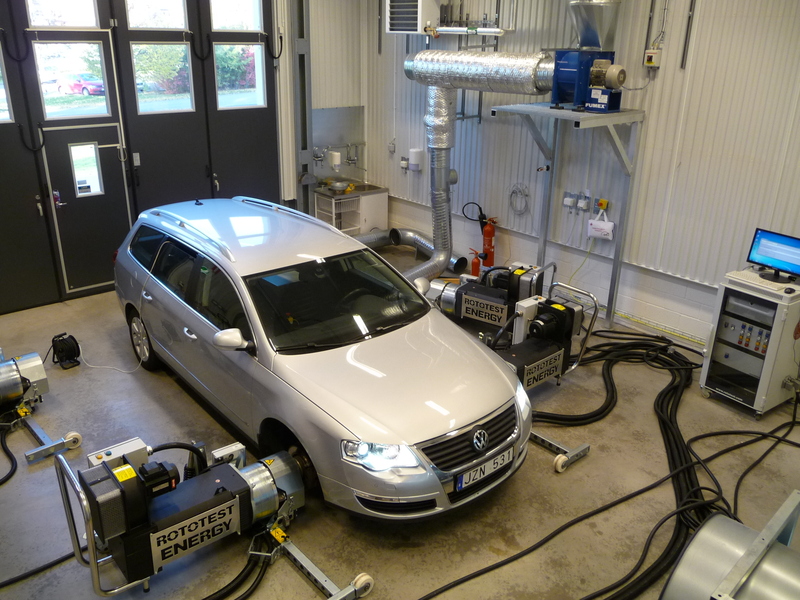 In a project funded by the Swedish Energy Agency this lab is to be used to study the possible benefits of having access to an eletric vehicle as a backup power source to enable a more flexible scheduling of power consumption. 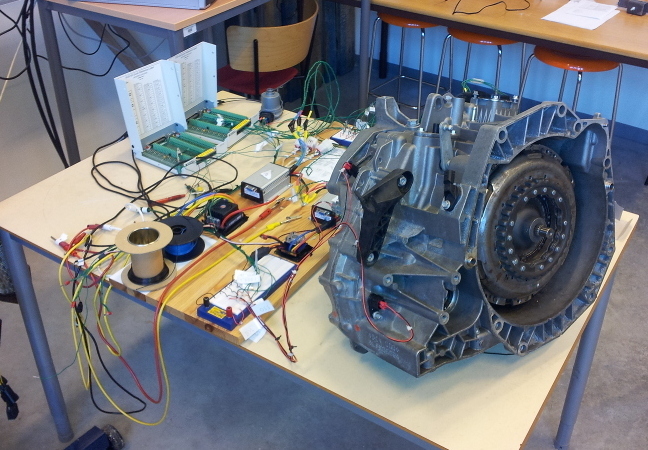 As a general purpose lab-area the lab can also be used for student projects and as an example the lab has been used in a project studying control of an electromechanical actuation system for a dual clutch transmission. In the future we may see a full scale transmission rig used for clutch modeling and control.